Making soy milk at home is not really hard..You don't needs to have special soy milk maker to make this delicious healthy drink.All you needs is a blender,a large size white clothes, large sieve and a large stock pot..I think I has problem when drinking soy milk sold at supermarket counter.Whenever I drink ready made soy milk,I will have several headaches and later resulted to vomit.I think my body reacted to the preservative added to the ready made soy drink.As we know soy milk intended to get spoilt easily,that the reason why soy milk maker have to add preservative to this product... Taaa...dah!! less than an hour ,I can have a glass or more fresh and healthy soy milk !! 1:Grind soaked soy bean with some water in blender until almost fine.Pour the grinded soy bean into a large stock.Repeat the same procedure until done. 2:Place stock pot at high heat,keep stirring to prevent the pulps from sticking or burn at the bottom.When it's bubbly boil,reduced the heat to medium,let it simmer for 20 minutes but remember keep stirring. 3:Remove the stock pot from heat.Use a large white thin clothes or cheese clothes over a large sieve.Scoop soy milk with pulps into the sieve,use ladle to compress or squeeze the hot milk out into another large stock pot. 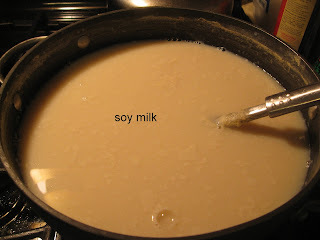 4:Discard the pulps ,simmer the sieved soy milk at low heat for 10 minutes.Add in sugar to taste.Serve warm or cold. I bought a whole big taro or some people called yam on my last trip to Queens.It's about 5 pounds..I used half of the whole taro for this dish and left the other half for making dessert later..I like the flavor of taro and it's starchy texture which is soft and tender..This vegetarian dish is taste great pairing with any type of steamed rice..
1 tsp white pepper powder. 1:Prepare steamer or wok with water at high heat to steam the cut taro until tender soft.Heat wok with oil and garlic.Fry garlic for 40 seconds then toss in sweet pepper and onion.Use spatula to stir well. 2:Toss in steamed taro,fish oil,oyster sauce white pepper powder,sugar,salt and water,stir well.Check the seasoning. 3:Dish out and serve warm as dinner. These day our weather is getting colder.For me Fall is one of the best season after Spring.The best food for us to warm our body is a big bowl of hot and spicy soup!! I bought plenty of tom yam paste from my last trip back from Malaysia..Right now it's the best time to make this tom yam soup!! Making tom yam soup is no brainier at all.I can have a bowl of spicy and warm soup is ready to eat within 30 minutes! 1:Prepared medium stock pot with water at high heat.Add in tom yam cubes or anchovies cubes. 2:When liquid rolling boil,add in carrot,kaffir lime leaf,tom yam paste and sambal-belacan-paste .Boil for another 10 minutes. 3:Add in bell pepper,onion,tomato,shrimp,squid and fish,cook for 5 minutes.Check the seasoning. 4:Dish out and serve warm. Last month when I was in Queens ,I bought some sweet potato .Now I wonder what to do with it before it's rot.At first I wanted to make some sesame ball but after steamed the sweet potato ,I decided to make plain sweet potato ball for convenience reason. (read here: suddenly L.A.Z.Y mode on the way!! hahaha!! )This dessert is easy and simple to make as long you have the 3 main ingredients :sweet potato,glutinous flour and sugar.Honestly, this sweet potato dessert is not bad at all pairing with hot coffee as snack or afternoon tea. 1:Peeled and cut sweet potato before steam at high heat.I steamed in steamer for 30 minutes at high heat.If you don't have steamer or wok or want a easy way then you can use microwave to steam at high heat until soft.I didn't know long long coz I never use microwave for steaming potato or yam..
2:Then mashed steamed sweet potato while it's still warm until mushy.Add in glutinous flour and sugar,knead together until well blended. 3:Then divided the dough in ball shape about 50 gm each.Heat oil in fryer or deep stock pot at medium high heat about 320 F.Place the balls on the hot oil,fry until golden brown. 4:Remove fried sweet potato ball from fryer to paper towel to absorb excess oil.Serve warm with tea or coffee. I bought a box of 5 pounds minced chicken from BJ's wholesale.I prefer to use minced chicken in my Chinese or Asian cooking rather than minced beef due to religion reason.I freeze half of the minced chicken and use the other half to make this chicken cake.Since I still have Thai's basil in my garden,I created this chicken cake using this special herb and other vegetables.This chicken cake is suitable as an appetizer or snack and you can serve it with your favorite sauce:chili sauce or sweet chili sauce or garlic chili sauce. 1:Combine ingredients A and B together in a large bowl.Use a large spatula to mix the ingredients well.Check the seasoning. 2:Heat skillet with oil a medium heat.Pat your hands wet with cold water.Use the spatula to scoop a handful chicken mixture on your palm,shape like burger shape.Place the patty on the skillet. Fry both side of the patty until golden brown,about 5 minutes. 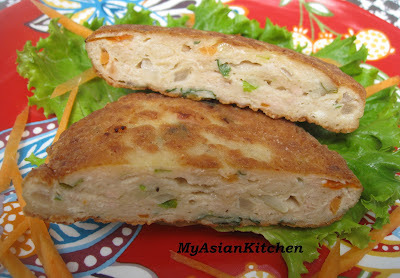 3:Remove chicken cake from skillet to a paper towel to absorb oil.Cut the cake and serve warm with your favorite sauce.